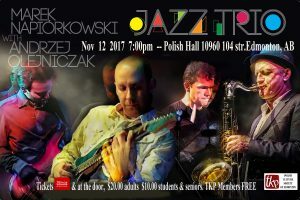 Marek Napiórkowski Trio consists of three extraordinary musicians: Marek Napiórkowski, guitar, Michal Baranski, bass, and Cezary Konrad, drums. Andrzej Olejniczak as the guest of the Trio is the one of the most recognized Polish saxophonists on the international stage. The concert is a mixture of lively, energetic improvised music, expressive solo parts, as well as delicate lyrical ballads. Tickets available at Tix on The Square, tel: 780-420-1757 and at the doors. adults: $20, seniors and students: $10.